VSM, or Value Stream Mapping, is a lean-management method for documenting and analyzing the steps of the end-to-end process that takes a service or product from its request to its delivery to the customer. This method can be practiced with essentially any value chain. What makes VSM more valuable than a typical process map? In short, the information gathered and presented in a VSM is at a higher level, covering more areas of interest at a broader scope, whereas a typical process map has more detail for a smaller part of the value stream. Additionally, VSM goes beyond merely considering the flow of the project, as it also illustrates the information flows and communication systems that are involved. What are the steps of VSM? Plan and prepare: start by identifying the target of the map and defining the problem to be addressed. Come up with objectives and goals, and form teams. , showing the current steps and any delays that occur between steps. Key data should be collected for each step, including process times, length of delays, and the capacity of each step. Analyze the current state VSM, looking for opportunities to improve flow and eliminate waste. Draw a future state VSM. Work as a team to brainstorm improvements and create a better VSM that reduces the number of steps, reduces rework, or reduces the delays between steps. Work toward that future state VSM. Closing the gap between current state and future state might require many opportunities for improvement, Events, or Projects - all of which can be managed by improvement management software such as KaiNexus. When should VSM be used? Value Stream Mapping is most commonly associated with manufacturing, but it is also present in product development, logistics, software development, supply chain, service industries, healthcare, and administrative processes. In short, Lean environments in almost any industry can use VSM to improve internal processes and procedures, enabling them to provide customers with better goods and services. 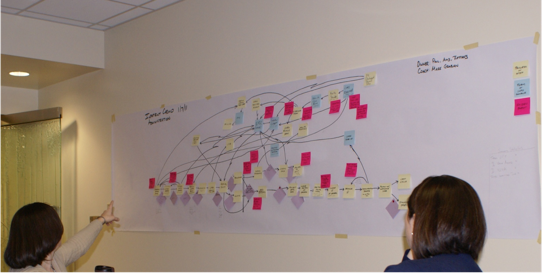 VSM is often used to identify areas of interest for future projects or Kaizen events.